Western New York’s delayed start to spring means a delayed start to the golf season. That means duffers are going crazy waiting for our weather to improve so they can hit the links. Sports humorist Jeff Wozer has the top signs that the frustration is freezing over. • Every high school track meet has been delayed waiting for police to remove golfers practicing bunker shots from long jump pits. • To handle crowds the Paddock Chevrolet Golf Dome has added an executive miniature golf course – all par ones. • For penance local priests are telling parishioners to say two Hail Mary’s and watch Don Paul’s forecast. • The Brookfield Country Club has hired Michael Cohen to sue Canada for excessive cold air. • Local golf shops now carry golf mittens, insulated Footjoys, and soft-spike crampons. • Driving ranges have replaced flag targets with Kevin O’Connell cut-outs. • Bear Grylls demonstrates on Tee 2 Green how to start a fire by rubbing two golf pencils together. • Due to crowds the Paddock Chevrolet Golf Dome now employs miniature golf rangers. 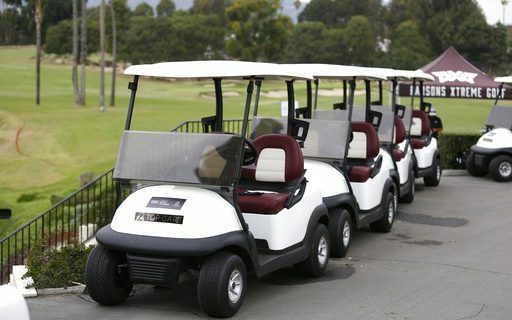 • Golf cart tire chain laws in effect through June. • Top selling drink at the Grill at the Dome: vodka and ball washer fluid. For more from Jeff, check out the top things we learned at Augusta and the top mistakes made by Phil Housley.